No one wants to deal with ticks, but even those of us who remain inside rather than brave the outdoors can easily find ourselves or our pets in a ticky situation! Get it? Getting a tick off you or your pet has always been a pain. Enter the Tick Twister! This little device was designed by a veterinarian in France and allows you to remove ticks easily without the use of chemicals. 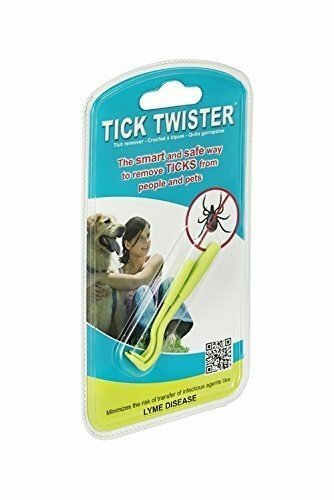 If you find a tick on yourself, simply use the Tick Twister by grabbing onto the tick and twisting. Voila! The tick has been removed! It completely removes the tick without taking off its head or squeezing the tick’s abdomen. You can use the Tick Twister on yourself or on animals like dogs, cats, and horses. The Tick Twister is small enough and easily mounts on your keyring for easy carrying. If you’re an outdoor lover or have outdoor animals, this device would be invaluable. Because the Tick Twister does not squeeze the abdomen of the tick when removing, there’s less risk of catching infectious agents like Lyme Disease. No more tweezers, matches, chemicals, or whatever other creative method people come up with to remove ticks. All you need is a simple Tick Twister and you’re set!